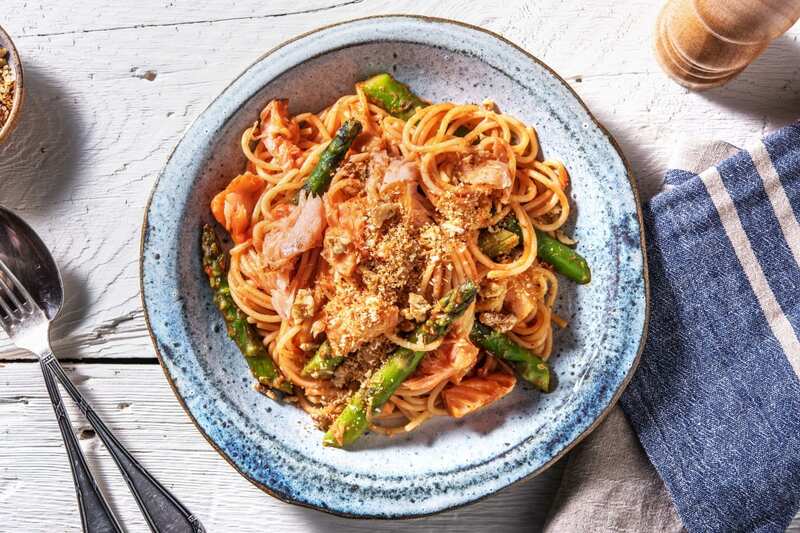 Quick, comforting, and filled with fresh zesty flavours, our creamy smoked salmon spaghetti is the perfect recipe for cosy nights in. Garlic and red chilli are fried until soft and golden before being gently combined with smoked salmon, fresh lemon, chopped chives and crispy asparagus in a velvety crème fraîche sauce. Toss the sauce through the spaghetti and serve in deep bowls. 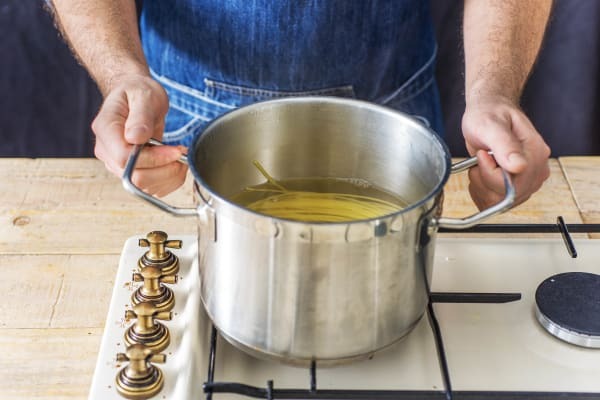 Bring a large saucepan of water with a pinch of salt to the boil for the pasta. When boiling, add the spaghetti and cook for 11 mins, then drain in a colander. a) Meanwhile, trim the bottom 1cm from the asparagus then chop in half widthways. Peel and grate the garlic (or use a garlic press). Roughly chop the walnuts. Heat a drizzle of oil in a large frying pan on medium heat. When hot, add the panko breadcrumbs and walnuts and toast, stirring occasionally, until golden, 2-3 mins. When done, transfer to a bowl, wipe out the pan and return to medium heat with a drizzle of oil. Add the garlic and cook, stirring, for 30 seconds. Pour in the tomato passata and water (see ingredients for amount) along with a pinch of salt and pepper and some sugar (if you have any). Bring to the boil then reduce the heat and simmer for 2 mins. When the pasta has 3 mins left, add the asparagus to the boiling water with the pasta. a) Carefully stir the drained pasta and asparagus through the sauce, then add in the hot smoked salmon flakes and combine. Cook for 2 mins or until the salmon is piping hot. Season to taste with salt and pepper. a) Serve the hot smoked salmon spaghetti in bowls with the nutty crumb sprinkled on top.